School strike attendees listen to 16-year-old Rebecca Hamilton talk about climate action. “What do we want? Climate action! When do we want it? Now!” chanted Rebecca Hamilton to an audience of over 2,000 people, standing atop the Vancouver Art Gallery steps on March 15. 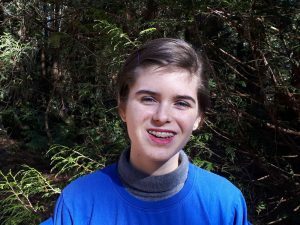 The 16-year-old environmental activist started Sustainabiliteens Vancouver. She is one of the key organizers behind a series of global school strikes, uniting young people around the world to demand climate action from leaders. “By putting aside our normal lives, we prioritize climate action – and that’s what all levels of government also need to be doing,” said Hamilton. Hamilton is at the centre of a youth-driven movement across the globe. 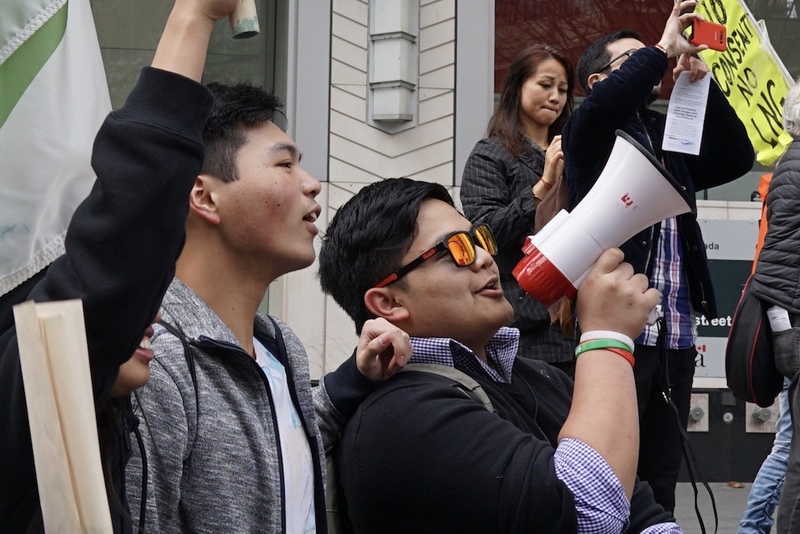 Young people are mobilizing using social media and mobile devices to connect and organize. They are calling on world leaders to take urgent action to save the planet — something that has been a challenge for decades. It’s a message that Severn Cullis-Suzuki appreciates more than most. At the Rio Earth Summit in 1992, 12-year-old Cullis-Suzuki gave a speech urging leaders to take climate action. “I am fighting for my future,” she said 27 years ago. Today, reflecting on her speech at Rio, she is blunt in her assessment. 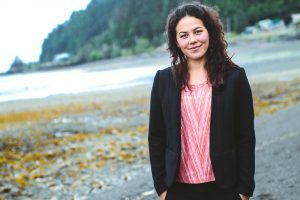 Despite the lack of meaningful climate action, Cullis-Suzuki remains optimistic because of advances made in access to information in the years since she first spoke out. “The sheer access to science and to knowledge is huge and we can’t underestimate that because we have some incredible tools that we didn’t used to. Therein lies a lot of hope,” she said. Climate change started making headlines in the 1970s, but the formation of the Intergovernmental Panel on Climate Change in 1988 was a watershed moment for the climate-change discourse. Since then, the IPCC has released five assessment reports based on data from hundreds of leading climate experts. Each assessment report has used progressively stronger language, meaning that the confidence in climate science and global warming has grown. The fourth and fifth reports, released in 2007 and 2014 respectively, were pivotal sources of science. Hamilton grew up during a time when there was no longer a debate about whether climate change exists. She and her peers are frustrated with what they perceive as a dissonance between science and government policy. Hamilton learned about these types of actions in the Trek Outdoor Education Program, which is a specialized program at Vancouver’s Prince of Wales Secondary School. Students enrolled in Trek complete the full B.C. Grade 10 curriculum while simultaneously engaging in outdoor activities and developing an understanding of the natural world. Some environmental educators in B.C. believe that place-based learning and outdoor education are pivotal pieces of education. 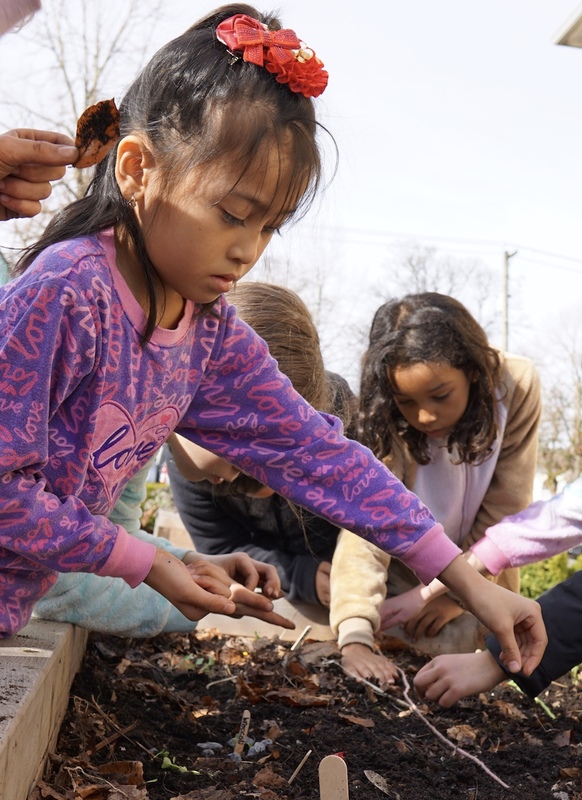 “In my formal schooling, in terms of elementary and secondary, there wasn’t a lot of outdoor learning,” said Nick Townley, Trek teacher and vice-president of the Environmental Educators Provincial Specialist Association. The revised B.C. curriculum that was introduced in 2016 makes it easier for teachers to integrate outdoor education and sustainability into classroom curriculum, says Townley. “It’s really important to have an appreciation for environmental issues and meaningfully integrate that into curriculum,” said Townley. That experience with Trek strengthened Hamilton’s resolve to pursue environmental activism, but she was surprised when she returned to regular school and her peers didn’t have the same understanding. School strikers marching from the Vancouver Art Gallery to the Vancouver office of Environment and Climate Change Canada. Hamilton is hoping to normalize climate-change conversations by channeling her ideas into activism. She believes her generation can offer a new perspective to climate activism by injecting urgency to the conversation. “We are not entrenched into this status quo yet. We are still in touch with our imaginations and we know that a better world is possible,” she said. Hamilton’s activism is part of a global movement spearheaded by 16-year-old Swedish activist Greta Thunberg, who began striking from school for climate in 2018. Thunberg has been nominated for a Nobel Peace Prize for her work. Now, students all over the world are looking to her for direction and it seems to be working. Here in Vancouver, Hamilton’s hopes were met on Jan. 16. 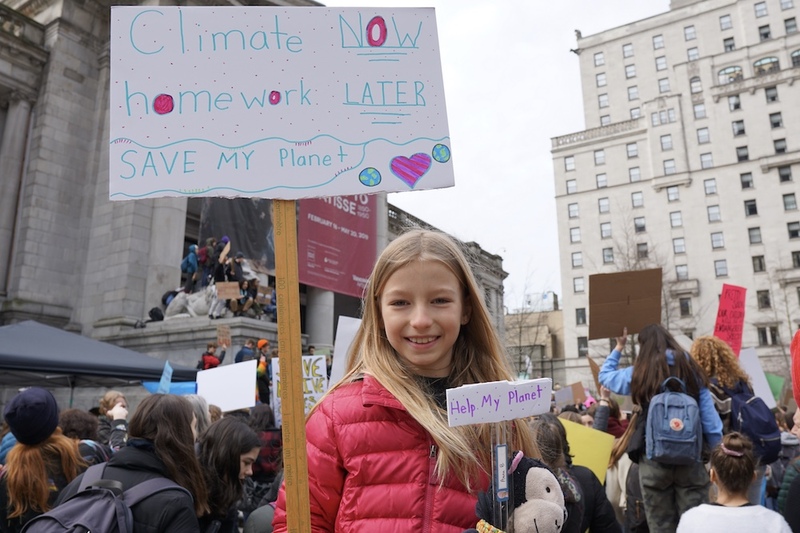 She and a group of students gathered at city hall to attend the school strike and urge councillors to pass a motion declaring a climate emergency. That evening, city council voted unanimously to pass the motion. 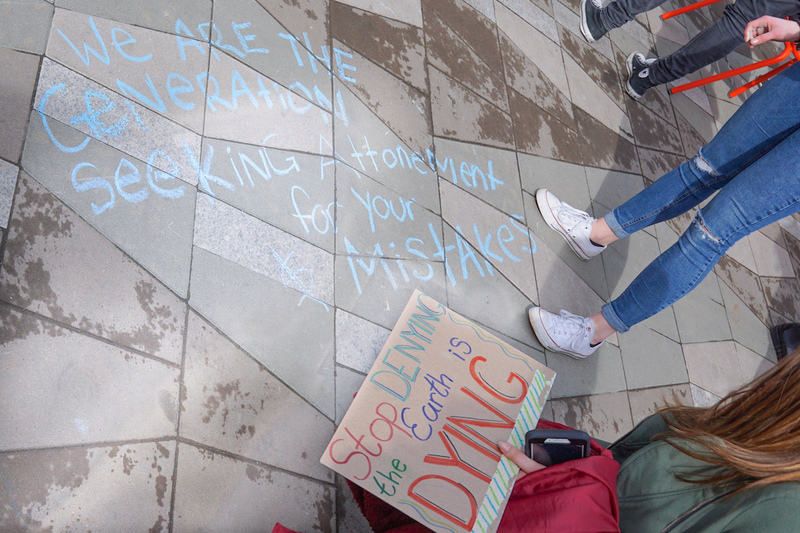 Students at the Vancouver Art Gallery shared chalk and wrote climate messages on the pavement. 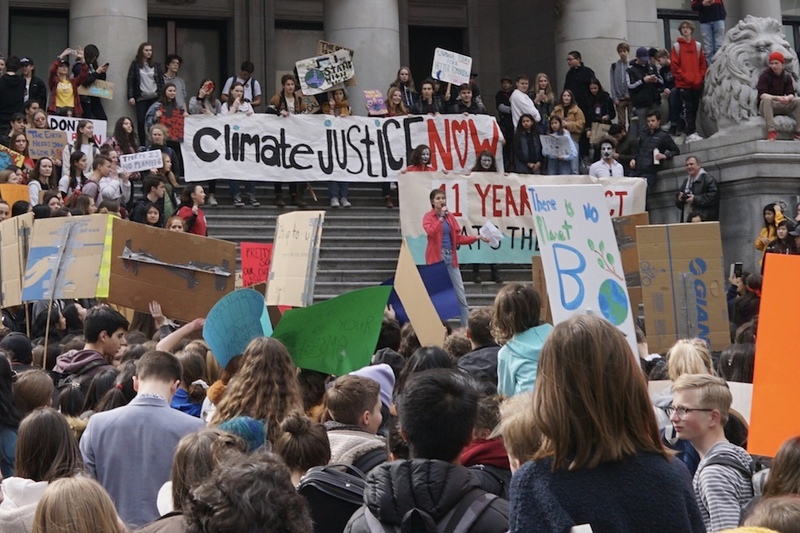 School strikes for climate are allowing young people to unite and express their worries for the future. Cullis-Suzuki is relieved to see young people have found empowerment in joining together. 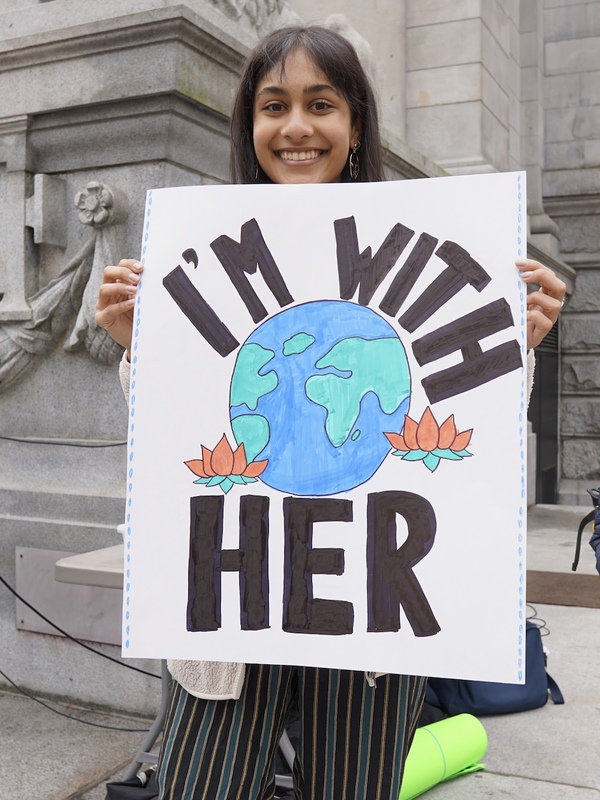 She maintains hope that with the meaningful support of adults, young voices can turn political tides on climate change. Here are the faces of the new generation of environmental attitudes in Vancouver. Tein, eight. Tein is a student in the SeaSmart after-school program. 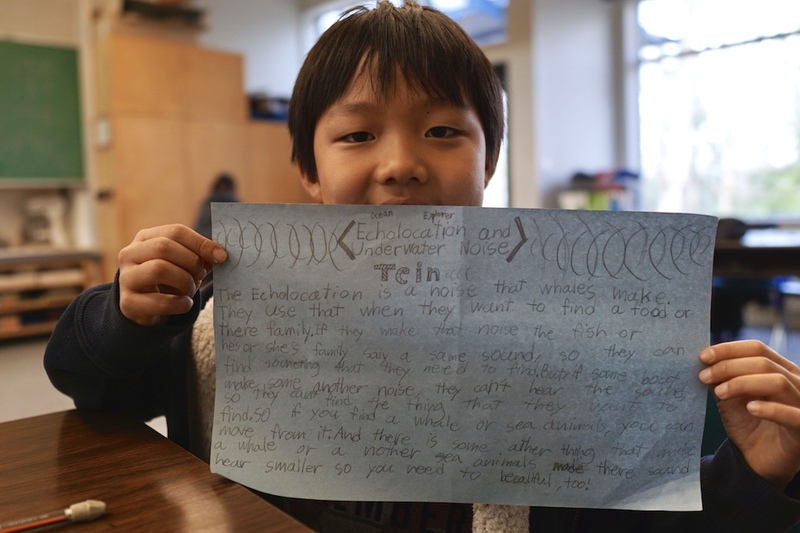 Here, Tein shares his final project — a poster on whale echolocation. Sujanya, 16. “She can’t march with her leg cast on, but she still came out to support the movement,” Sujanya’s mother chimed in. Anna, eight. 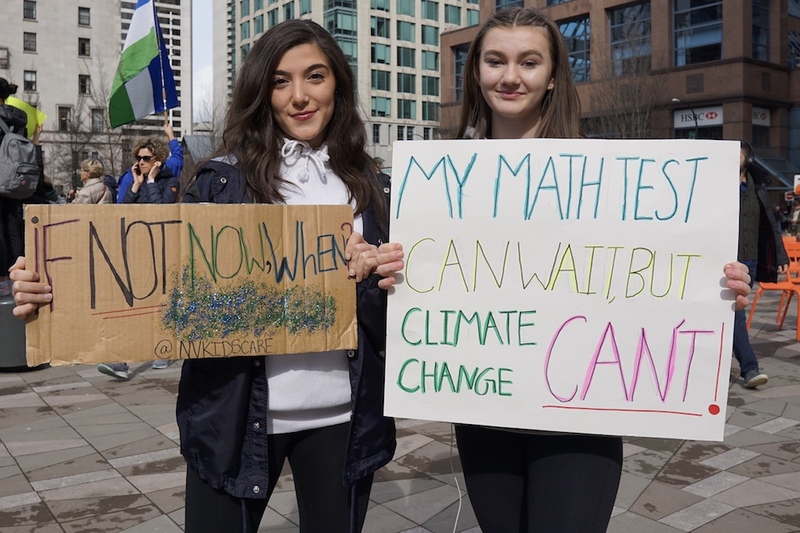 Anna attended the Vancouver school strike for climate with her brother and mother. Venus, 13 & Wesley, 12.